Combine the Speed of an Analog Controller With the Flexibility of a Digital Microcontroller No system can perform without reliable power supplies. Our Digitally Enhanced Power Analog (DEPA) family of products combines the performance of an analog Pulse-Width Modulation (PWM) controller with the configurability of an 8-bit PIC® microcontroller (MCU). The combination of these methods allows the addition of digital features to a reliable, easy-to-implement analog control loop, including fast transient responses, high efficiencies, reliable gain and phase margins. Adding the ability to measure and respond to changes with tailored algorithms improves the robustness of the system, while offering diagnostic and communication options. The single-chip solution can accept a high-voltage input and regulate a wide output current or voltage range, which allows you to maintain robust operation within an unstable environment. Discover how the flexibility of our DEPA products can enhance your next design. electricity use away from on-peak time (and more control over bills) than is truly possible.” Reading between the lines, it’s not hard to see what happened in this pilot program which took place during summer months: Consumers arrived home from work, typically found the internal temperature of their residence was somewhere near 90°F, and immediately hit the a/c, peak rates or no. Then to save money, they turned off a light bulb or two. When the utility bill arrived, sadness ensued. The results of the study don’t bode well for TOU promoters. Even more worrisome is that the people who took part in the study were probably more sympathetic to TOU than the general population. All of them voluntarily opted in for the billing scheme. Those in the study were also better educated, older, and included a higher percentage of homeowners than the U.S. average. Expect a lot more resistance to TOU billing rolled out to a broader base of much less understanding consumers, a few of whom will undoubted be convinced TOU is some kind of government conspiracy. When that happens, the entities expressing the most disappointment won’t be consumers but rather the companies whose economic success depends on selling TOU contrivances. It pays to understand a few important electrical parameters that can dictate the kind of applications specific power supplies can handle. The promise of high efficiency and small size brought by super-fast switching power supplies could be delayed by a lack of magnetic materials that are up to the task. Compared to the LED bulbs of only a few years ago, modern-day versions are simpler and assembled via more automated methods. EMI can emanate from high di/dt loops found in some switch-mode supply topologies. New controllers overcome these difficulties by integrating key components inside the chip package. There are some uses that demand the low noise and fast response only available through traditional linear supplies. New converter topologies and power transistors promise to reduce the size and boost the efficiency of supplies that will run nextgeneration AI platforms. Not all power supplies react to over and under-voltages and currents in the same way. It pays to know the tradeoffs of different approaches to protection. High electron mobility transistors reduce power supply size thanks to a special make-up that eliminates sources of energy loss. parameters that can dictate the kind of applications specific power supplies can handle. 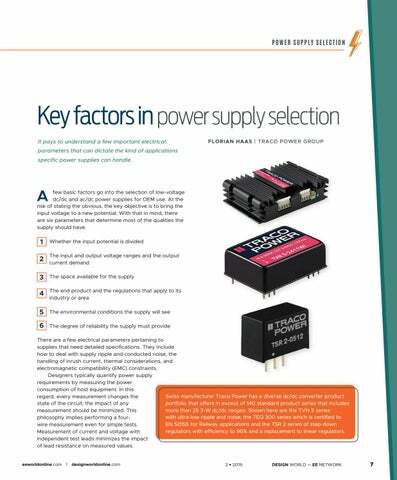 few basic factors go into the selection of low-voltage dc/dc and ac/dc power supplies for OEM use. At the risk of stating the obvious, the key objective is to bring the input voltage to a new potential. With that in mind, there are six parameters that determine most of the qualities the supply should have. Four-wire measurements supply current via a pair of leads called force connections. These generate a voltage drop across the impedance to be measured. A pair of voltage leads called sense connections sit immediately adjacent to the target impedance, so they do not include the voltage drop in the force leads or contacts. Because almost no current flows to the measuring instrument, the voltage drop in the sense leads is negligible. Customarily, the sense wires are the inside pair while the force wires are the outside pair. Exchanging the force and sense connections can degrade measurement accuracy because more of the lead resistance is included in the measurement. The force wires may have to carry a large current when measuring small resistances so they must be large enough to handle the anticipated level of current. The sense wires can be of a small gauge. Circuit connections for a typical four-wire measurement with a source and load. Probing dc/dc converter pins For accurate measurements of dc/dc converter parameters, the scope probe head ground ring and measurement tip must be in direct contact with the converter pins. To compare results with manufacturer data, oscilloscope bandwidth is limited to 20 MHz, a common value for laboratory work. An example of inrush voltage in a LED lamp (yellow line). The voltage pattern in the lamp is in purple. The LED reaches its maximum current draw of about 10 A at the point where it switches on (point T, in orange). Within 10 msec current draw has returned to 300 mA. level standards include IEC 61800-3 and IEC 61326-1, which dictate EMC requirements for adjustable-speed motor drive systems and laboratory equipment, respectively. Virtually all CISPR-based test standards specify limits for conducted emissions measured up to 30 MHz, except for CISPR 25, where the applicable upper frequency extends to 108 MHz. EN 55015, based on CISPR 15 for lighting equipment, has a measurement range extending down to 9 kHz for some apparatus. Use of a dc/dc converter with an internal filter doesn’t guarantee adherence to EMC values because EMC compatibility can often be affected by several components. In many cases, the output connections must include one to protective earth for safety reasons, and this can have a significant impact on EMC. Usually, the power supply manufacturer can offer advice regarding how to adhere to EMC values. Most power supply manufacturers provide help in the form of suggestions for suitable filters on their websites. For example, suggestions can be downloaded directly from the relevant device’s page at www.tracopower.com. If you can’t find the circuit diagrams for the product you have selected, don’t hesitate to contact the manufacturer directly on the phone or by email. Measure Power, Monitor Temperature and Turn on Your Fan Before it Gets Too Hot! How many parts does it take to accurately measure temperature and manage power? With our high-side current sensors, it could be as few as one. For example, the EMC1701/2/4 family has one current sensor and can monitor one, two or four temperature channels respectively. 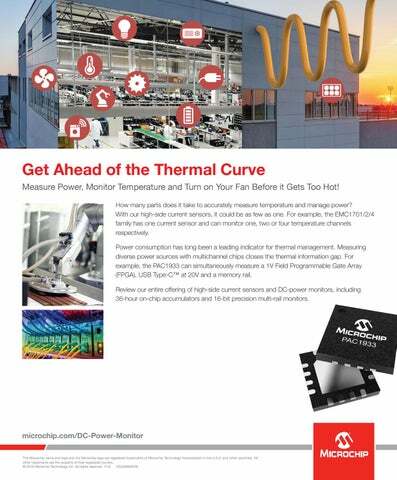 Power consumption has long been a leading indicator for thermal management. Measuring diverse power sources with multichannel chips closes the thermal information gap. For example, the PAC1933 can simultaneously measure a 1V Field Programmable Gate Array (FPGA), USB Type-C™ at 20V and a memory rail. Review our entire offering of high-side current sensors and DC-power monitors, including 36-hour on-chip accumulators and 16-bit precision multi-rail monitors. TONY ARMSTRONG | POWER BY LINEAR ANALOG DEVICES INC.
overcome these difficulties by integrating key components inside the chip package. goes without saying that PCB layout sets functional, electromagnetic interference (EMI) and thermal behavior of every power supply design. Switching power supply layout is not black magic, but it is often overlooked until late in the design process. Many switchmode power supply designers are familiar with the design complexities and nuances of switch mode operation. But a lot of these old hands are literally retiring and leaving the industry! 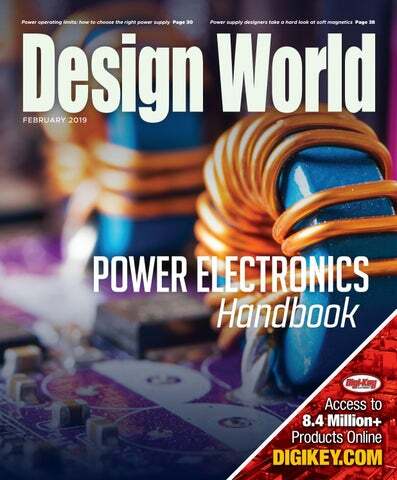 Consequently, more and more digital designers are being asked to take on switch-mode supply designs for no other reason than too few analog power supply designers to get the job done. Most digital designers know how to design with a simple linear regulator; it is less clear they are equipped to handle more complex designs such as step-up mode (boost) or even a buckboost topology (buck and boost modes combined). This leaves many electronic systems manufacturers wondering how their switch-mode supply circuits will get done. Companies that make ICs for switch-mode supplies are aware of this brain drain. So they are devising chips that help remove some of the complexity involved in the design of switch-mode circuitry. To understand these developments, consider the example of the basic buck regulator as diagramed in the nearby schematic. High di/ dt and parasitic inductance in the switcher “hot” loop causes electromagnetic noise and switch ringing. EMI emanates from the high di/dt loops. The supply wire as well as the load wire should not have high ac current content. Accordingly, the input capacitor C2 should source all the relevant ac currents to the output capacitor where any ac currents end. A simplified synchronous buck regulator and the high di/dt loops its topology creates. During the on cycle with M1 closed and M2 open, the ac current follows the solid blue loop. During the off cycle, with M1 open and M2 closed, the ac current follows the green dotted loop. Most people have difficulty grasping that the loop producing the highest EMI is not the solid blue nor the dotted green. Only in the dotted red loop flows a fully switched ac current, switched from the zero to I peak and back to zero. The dotted red loop is commonly referred to as a hot loop because it has the highest ac and EMI energy. It is the high di/dt and parasitic inductance in the switcher hot loop that causes electromagnetic noise and switch ringing. To reduce EMI and improve performance, one must minimize the radiating effect of the dotted red loop. If we could reduce the PCB area of the dotted red loop to zero and buy an ideal capacitor with zero impedance, the problem would be solved. However, in the real world, it is the design engineer who must find an optimal compromise. The source of the high-frequency noise is the energy from switching transitions that is coupled though parasitic resistors, inductors and capacitors and creates high-frequency harmonics. So, knowing where the noise is generated gives clues about how to reduce it. The traditional way to reduce noise is to slow the MOSFET switching edges. Designers can mitigate these edges by slowing the internal switch driver or by adding snubbers externally. 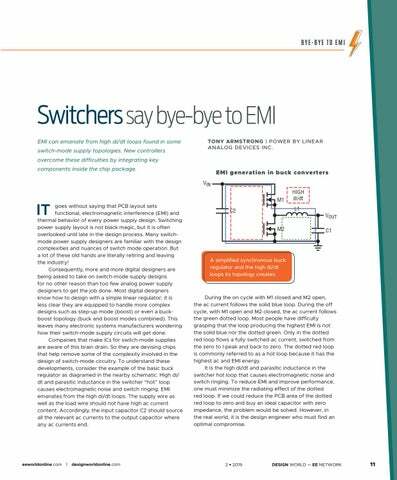 However, these measures will reduce the efficiency of the converter because they increase switching loss – especially if the switcher runs at a high switching frequency, say 2 MHz. There are several reasons for running at 2 MHz, which is relatively high for a switching supply: This switching rate enables the use of physically smaller external components such as capacitors and inductors. For example, every doubling of switching frequency leads to a halving of inductance value and output capacitance value. In automotive applications, switching at 2 MHz keeps noise out of the AM radio band. Filters and shielding can also be employed, but at the price of more external components and circuit board area. Spread-spectrum frequency modulation (SSFM) could also be implemented – this technique dithers the system clock within a specified range. SSFM reduces EMI in switching regulators. Although the switching frequency is most often chosen to be outside the AM band (530 kHz to 1.8 MHz), unmitigated switching harmonics can still violate stringent automotive EMI requirements within the AM band. Adding SSFM significantly reduces EMI both within the AM band as well as other regions. Or, one could simply use ADI Silent Switcher technology. It delivers high efficiency, low EMI, and sustains high switching frequencies with no tradeoffs. The most obvious difference between the LT8610 synchronous step-down regulator and the LT8614 Silent Switcher is the addition of a second VIN and ground pin which permits the connection of special filtering capacitors. The LT8614 radiated EMI performance lets it pass the most stringent CISPR25 Class 5 limits. The LT8614 Silent Switcher technology has been tested against a current state-of-the-art switching regulator, the LT8610. Testing took place in a GTEM cell using the same load, input voltage, and the same inductor on the standard demo boards for both parts. We found that using the LT8614 Silent Switcher technology brings a 20-dB improvement compared to the already good EMI performance of the LT8610, especially at more-difficult-to-manage higher frequencies. Switching supplies based on the LT8614 need less filtering compared to other sensitive systems. Furthermore, the LT8614 exhibits benign time-domain behavior on its switch node edges. The LT8614 exhibits impressive performance, but it is not the end of the road. The LT8640 step-down regulator also features Silent Switcher architecture and delivers high efficiency at frequencies up to 3 MHz. Assembled in a 3×4mm QFN, the monolithic construction with integrated power switches and inclusion of all necessary circuitry yields a minimal PCB footprint. Transient response remains excellent and output voltage ripple is below 10 mVP-P at any load, from zero to full current. The LT8640 allows high-VIN-to-low-VOUT conversion at high frequency with a fast-minimum top switch on-time of 30 nsec. The LT8640 and the more integrated LT8640S. The part number of the new higher integrated version carries an “S” suffix. To improve EMI/EMC, the LT8640 can operate in spreadspectrum mode. This feature varies the clock with a triangular frequency modulation of +20%. Here, a triangular frequency modulation varies the switching frequency between the value programmed by an external resistor (RT) to approximately 20% higher than that value. The modulation frequency is approximately 3 kHz. For example, when the LT8640 is programmed to switch at 2 MHz, the frequency will vary from 2 MHz to 2.4 MHz at a 3-kHz rate. When spread-spectrum operation is selected, Burst Mode operation is disabled, and the part will run in either pulse-skipping mode or forcedcontinuous mode. One possible difficulty with Silent Switcher control is that placing the filter capacitors too far from the LT8614 on the PCB can still lead to operational problems. Silent Switcher 2 eliminates this possibility by integrating the filter capacitors -VIN caps, IntVCC and Boost caps – inside a new LQFN package. This integration puts all the hot loops and ground planes within the packaging. The result is lower EMI and a smaller footprint thanks to fewer external components. And the PCB layout is much less sensitive to component location. Silent Switcher 2 also enables better thermal performance. The large multiple ground exposed pads on the LQFN Flip-Chip package facilitate the extraction of heat from the package and into the PCB. 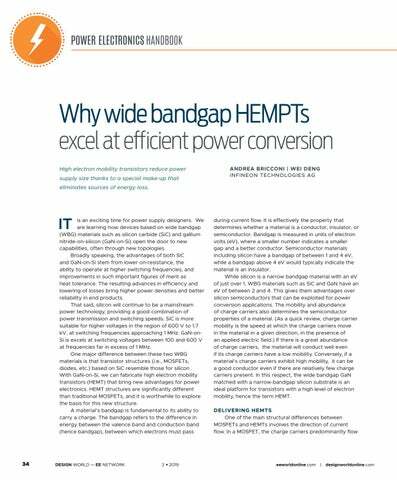 The elimination of high-resistance bond wires also boosts conversion efficiency. The EMI performance of the LT8640S easily passes the Radiated EMI Performance CISPR25 Class 5 peak limits with a wide margin. Silent Switcher technology can also be found in the LTM8053 and LTM8073 micromodule regulators where everything is virtually integrated with just a few external caps and resistors. Finally, it is worth pointing out that the reduction in PCB space made possible by Silent Switcher devices can also reduce the number of PCB layers needed. Check out the new products from the industry’s most award winning passive component supplier… KOA Speer. ALEX K ARAPETIAN | ACOPIAN TECHNICAL CO.
noise and fast response only available through traditional linear supplies. almost any engineer about linear power supplies and the likely instinctive reaction will be, “Sorry, I can’t use them — they’re too inefficient.” Any possibility of using a linear supply usually ends right there; it is as though you’re asking them to go back to vacuum-tube AM radios. Still, a good engineer knows that it’s wise to not make decisions based on assumptions and clichés, but rather on honest assessments of priorities and alternatives. 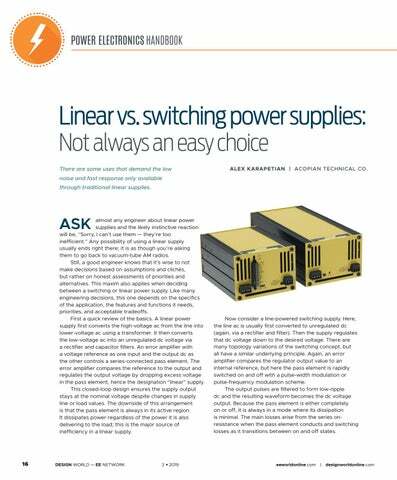 This maxim also applies when deciding between a switching or linear power supply. Like many engineering decisions, this one depends on the specifics of the application, the features and functions it needs, priorities, and acceptable tradeoffs. First a quick review of the basics. A linear power supply first converts the high-voltage ac from the line into lower-voltage ac using a transformer. It then converts the low-voltage ac into an unregulated dc voltage via a rectifier and capacitor filters. An error amplifier with a voltage reference as one input and the output dc as the other controls a series-connected pass element. The error amplifier compares the reference to the output and regulates the output voltage by dropping excess voltage in the pass element, hence the designation “linear” supply. This closed-loop design ensures the supply output stays at the nominal voltage despite changes in supply line or load values. The downside of this arrangement is that the pass element is always in its active region. It dissipates power regardless of the power it is also delivering to the load; this is the major source of inefficiency in a linear supply. Now consider a line-powered switching supply. Here, the line ac is usually first converted to unregulated dc (again, via a rectifier and filter). Then the supply regulates that dc voltage down to the desired voltage. There are many topology variations of the switching concept, but all have a similar underlying principle. Again, an error amplifier compares the regulator output value to an internal reference, but here the pass element is rapidly switched on and off with a pulse-width modulation or pulse-frequency modulation scheme. The output pulses are filtered to form low-ripple dc and the resulting waveform becomes the dc voltage output. Because the pass element is either completely on or off, it is always in a mode where its dissipation is minimal. The main losses arise from the series onresistance when the pass element conducts and switching losses as it transitions between on and off states. The linear supply from Acopian Power Supplies (left) is a factor of ten larger and heavier than a comparable switching supply (above) that is also from Acopian, but the linear unit has beneficial attributes which the switcher supply cannot match. LINEAR VS. SWITCHING SUPPLIES The typical linear supply has an efficiency of about 20% to 40%. This figure pales in comparison to the efficiency of a typical switching supply which comes in at 60% to 80% and can reach 90% in some cases. There are also major differences in size and weight. The switching supply is much smaller and lighter, largely because of the smaller transformer, discrete semiconductors, and passive components. For example, a 250-W linear power supply would require 600 in3 (a little under 9,000 cm3) of mounting space and would weigh 26 lb. (about 12 kg). A comparable ac/dc switching power supply could occupy one-tenth that volume and weigh just 2 lb. (0.9 kg). Voltage regulation in linear supplies wattage and global location. Some switching supplies meet the regulatory mandates by using spread spectrum clocking to spread the noise energy across a wide band. This way, the noise does not exceed allowed limits at the clock frequency or its harmonics. While this technique works in the “legal” sense to meet mandatory standards, the supply noise can still affect internal system circuitry. The linear power supply uses an all-analog closed-loop feedback approach to control its pass element such that the supply output voltage tracks the internal reference voltage. In the block diagram, the voltage divider at the right-hand side allows the user to set the output-voltage versus reference-voltage comparison ratio. TRANSIENT RESPONSE There is also the issue of transient response to sudden changes in load. The all-analog linear supply can be tuned to optimally respond to step-changes in load. The goal is to respond fast without overshoot or ringing, and a properly designed supply can provide this. In contrast, the closed-loop dynamics of the switching power supply are much more difficult to control. The switching supply may be slower or excessively overshoot and ring before it stabilizes, depending on design specifics and clock frequency. 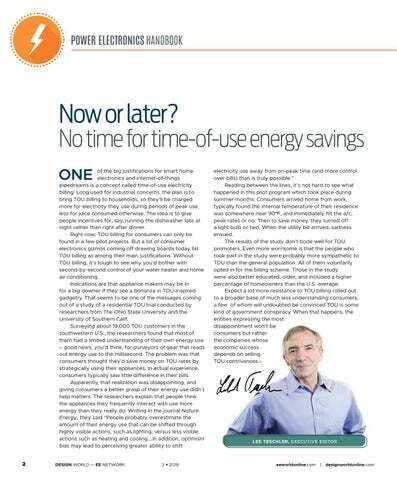 There is no doubt that the switching supply offers major benefits in efficiency, weight and size. But before assuming it is the right or only choice, engineers should consider the application as well as the impact of noise and ripple. There are installations where these attributes are not the priorities; instead, low ripple and output noise are the top priorities along with superior transient performance. Applications in this category include extremely low-noise amplifiers, advanced signal processing and data acquisition systems (including sensors, multiplexers, A/D converters and sample and hold circuits) and precision automatic test equipment (ATE) and laboratory test equipment. In the SMPS supply, the output voltage is regulated by clocked on/off pulse-width modulation of the pass element, resulting in low losses and high efficiency. But the output contains clock noise that must be filtered to establish a clean dc output voltage. supplies that will run next-generation AI platforms. A regulated, non-isolated 48-to-12-V and 48-to-5-V buck converter, followed by a 12 or 5-to-1-V buck converter. A regulated single-stage hybrid converter that goes from 48-to-1 V without an intermediate stage. The more traditional 48-to-12-V isolated and regulated “brick” followed by a non-isolated 12-to-1-V buck converter. A simplified schematic and plot of efficiency vs load current for several input voltages of the EPC9115 dc-dc converter. eGaN FET power shortage A simplified schematic of the EPC9093 development and a photo of the power stage holding the EPC2053 eGaN FETs. output power levels near 300 W and peak efficiencies of approximately 96%. Such converters include custom heat sinks to function at these high-power levels. Such converters typically run at 150 kHz to 175 kHz to mitigate switching losses. The low switching loss of the GaN transistors permit a doubling of the switching frequency to 300 kHz, which allows a great reduction in inductor and transformer size and a large boost in output current and power. The resulting converter is capable of fully regulated operation at an output current of 42 A, or 500 W at a 12-V output. It has realized a peak efficiency of 96.7% at 30 A (the max load current of the siliconbased converter), with a full-load efficiency of 96.4%. The transistors account for 28% of the total loss (approximately 1% of the total output power). On the other hand, the magnetic components account for > 48% of the total loss. Thus the transistors are no longer the main limiting factor in the converter design. A view of the EPC2053 100-V eGaN FET with 3-mΩ typical on-resistance. Non-isolated dc-dc converters can be physically small, efficient, and cost effective when based around GaN FETs. In one case, a 25-A, 48 V to 5-12-V converter was constructed using the EPC2053 eGaN FET. The EPC9093 GaN development board, configured as a synchronous buck converter, yields a main power stage area of only 10x9 mm, which is half the size of its silicon equivalents, and can produce an output voltage ranging from 5 to 12 V. The EPC2053 is a Generation 5 eGaN FET rated at 100 V with a 3-mΩ typical on-resistance capable of carrying a 32-A continuous current and operating with up to a 150°C junction temperature. The EPC2053 has lower parasitic capacitances and on-resistance than its silicon counterparts, yielding faster switching and lower power losses even at higher switching frequencies. 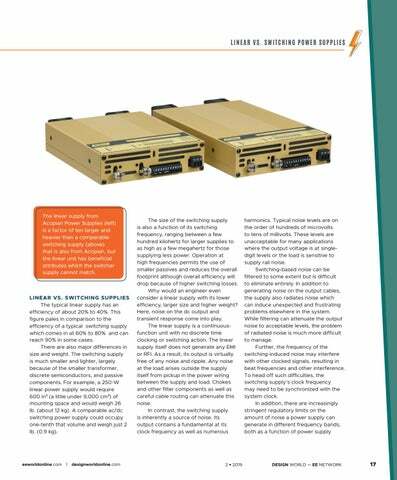 These qualities enable compact converters to produce high output power. When stepping down 48 V to 12 V at a 700 kHz switching frequency, the EPC9093 hits a peak efficiency of 97% when powering a 15-A load and maintains the efficiency above 96.5% with a 25-A load. A simplified schematic of the EPC9093 board and its power efficiency up to a 25-A output current for 5, 9, and 12-V output at a 700 kHz operating frequency using EPC2053 eGaN FETs. Simplified schematic of an N:1 LLC converter configured with center tapped rectifier. Below, the 1-MHz, 900-W-capable, 48-to-12-V LLC converter along with its dimensions. Power efficiency as function of output power at 40, 48, and 60-V input voltages. The LLC converter efficiency performance was measured for loads ranging up to 900 W. The efficiency performance shows that the LLC converter easily exceeds 98% over a wide load range and input voltage range. WIRE: round, square, rectangular, and flat foil INSULATION: thermal varnish, epoxy, silicone, oil TEMPERATURE: up to Class H 180 Celsius SAFETY: UL approval service, including class 2 FREQUENCY: 50/60 Hz, 400 Hz, up to 500 kHz POWER: 10 watts to 10,000 watts TOOLING: bobbins, cores, tubes, laminations, bases TOPOGRAPHIES: too many to mention! Photo, with dimensions, of the 1-MHz, 900-W-capable, 48-to-6-V LLC converter. The graph shows power efficiency as a function of output power at 40, 48, and 60-V input voltages. Dual-inductor hybrid converter A schematic of the 6-to-1 dual inductor hybrid converter and the physical prototype. Measured efficiency at a 48-V input with different output voltages. Note that at 48 VIN-to-1 VOUT the overall efficiency is 92% at 10 A. The converter efficiency remains higher than 90% down to a 20% load, important for data center applications where light-load efficiency is an issue. REFERENCES 1. 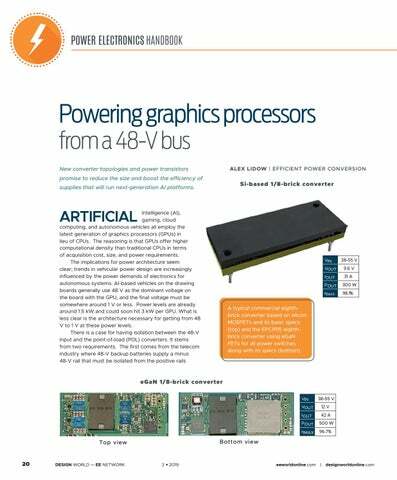 State-of-the-art in DOSA-standard eighth-brick converters: Glaser, J., Strydom, J. and Reusch, D., “High Power Fully Regulated Eighth-brick DC-DC Converter with GaN FETs,” in PCIM Europe 2015; International Exhibition and Conference for Power Electronics, Intelligent Motion, Renewable Energy and Energy Management; Proceedings of, 2015, pp. 406–413. 2. Non-isolated dc-dc converters: A. Lidow, J. Strydom, M. de Rooij, D. Reusch, “GaN Transistors for Efficient Power Conversion,” Second Edition, Wiley, 2014. 3. 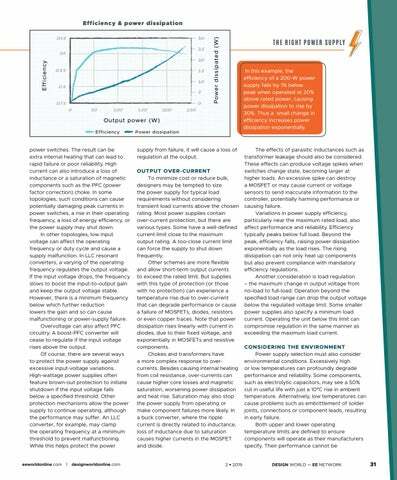 “Boosting Power Density in 48 V to 5-12 V DC to DC Converter Using EPC2053, with up to 25 A Output,” How2AppNote 009, Available at: http://epc-co.com/epc/Portals/0/epc/documents/ application-notes/how2appnote009%20-boosting%20power%20 density%20in%2048%20v%20to%205-12%20v%20dc%20to%20 dc.pdf 4. 48-V step-down LLC dc transformer: “Exceeding 98% Efficiency in a Compact 48 V to 12 V, 900 W LLC Resonant Converter Using eGaN® FETs,” How2AppNote 011, Available at: http:// epc-co.com/epc/Portals/0/epc/documents/application-notes/ How2AppNote011%20Exceeding%2098%20percent%20 Efficiency%20in%20a%20Compact%2048%20V%20to%2012%20 V%20Resonant%20Converter.pdf 5. 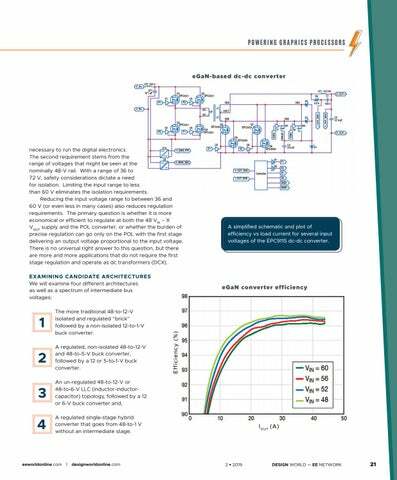 “How to Exceed 98% Efficiency in a Compact 48 V to 6 V, 900 W LLC Resonant Converter Using eGaN® FETs,” How2AppNote 014, Available at: http://epc-co.com/epc/Portals/0/epc/documents/ application-notes/How2AppNote014%20Exceed%2098%20 percent%20Efficiency%2048%20V%20to%206%20V%20 Resonant%20Converter.pdf 6. N:1 full bridge LLC converter: Huang, H., “Designing an LLC Resonant Half-Bridge Power Converter,” Reproduced from 2010 Texas Instruments Power Supply Design Seminar SEM1900, Topic 3, TI Literature No. SLUP263 7. Ahmed, M. H., Fei, C., Lee, F. C. and Li, Q., “48V voltage regulator module with PCB winding matrix transformer for future data centers,” IEEE Trans. Ind. Electron., vol. 64, no. 12, pp. 9302-9310, Dec. 2017. 8. 48V-to-1V Hybrid Converter: G.-S. Seo, R. Das, ad H.-P. Le, “A 95%-efficient 48 V-to-1 V/10 A VRM hybrid converter using interleaved dual inductors,” in Proc. IEEE Applied Power Electronics Conference and Exposition (ECCE), 2018. pp. 38253830 9. Y. Lei, R. May, and R. Pilawa-Podgurski, “Split-Phase Control: Achieving Complete Soft-Charging Operation of a Dickson Switched- Capacitor Converter,” IEEE Transactions on Power Electron., vol. 31, no. 1, pp. 770-782, 2016. 10. D. Baba, “Benefits of a multiphase buck converter,” Texas Instruments Inc., 2012. OPTIMIZING THE INTERMEDIATE BUS VOLTAGE We can now turn to the efficiency of the second stage. Multiplying the peak reported efficiency of various commercial POL converters with the efficiency of the first stage converters gives a reasonable estimate of comparative peak efficiencies going from 48 to 1 V. The best efficiency comes from coupling either the DIHC or the LLC with a 6-VOUT second stage. The DIHC topology, however, is relatively new and has yet to be widely adopted. New AI and gaming applications are quickly adopting the 48-VIN-to-6-VOUT LLC, coupled with a 6-VIN-to-1-VOUT buck converter because of its high efficiency, high power density, and low cost. Traditional bricks are going to be around for many more years but are probably not going to see much growth in leading-edge high-density computing systems. In all the topologies with 48 VIN, the highest efficiency comes with using GaN devices. This is due to their lower capacitance and smaller size. With recent pricing declines in GaN power transistors, the cost comparison with silicon-based converters now strongly favors GaN in all the leading-edge solutions. With their high K and small size, these 1:1 coupled inductors are the perfect match for your SEPIC and flyback applications Offered in thirteen body sizes and hundreds of inductance/current rating combinations, our MSD/LPD families are perfectly coupled to all your SEPIC and flyback designs. The MSD Family offers current ratings up to 16.36 Amps, low DCR, coupling coefficients as high as K ≥ 0.98, and up to 500 Vrms windingto-winding isolation. 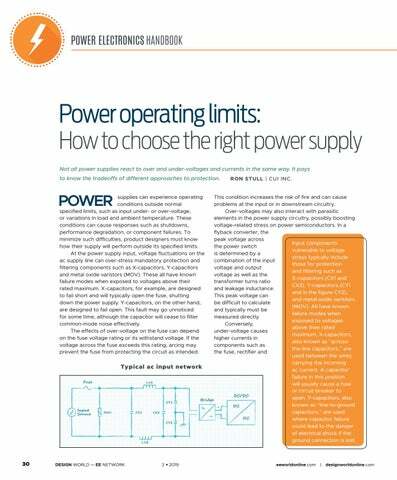 Power operating limits: How to choose the right power supply Not all power supplies react to over and under-voltages and currents in the same way. It pays to know the tradeoffs of different approaches to protection. supplies can experience operating conditions outside normal specified limits, such as input under- or over-voltage, or variations in load and ambient temperature. These conditions can cause responses such as shutdowns, performance degradation, or component failures. To minimize such difficulties, product designers must know how their supply will perform outside its specified limits. At the power supply input, voltage fluctuations on the ac supply line can over-stress mandatory protection and filtering components such as X-capacitors, Y-capacitors and metal oxide varistors (MOV). These all have known failure modes when exposed to voltages above their rated maximum. X-capacitors, for example, are designed to fail short and will typically open the fuse, shutting down the power supply. Y-capacitors, on the other hand, are designed to fail open. This fault may go unnoticed for some time, although the capacitor will cease to filter common-mode noise effectively. The effects of over-voltage on the fuse can depend on the fuse voltage rating or its withstand voltage. If the voltage across the fuse exceeds this rating, arcing may prevent the fuse from protecting the circuit as intended. RON STULL | CUI INC. This condition increases the risk of fire and can cause problems at the input or in downstream circuitry. Over-voltages may also interact with parasitic elements in the power supply circuitry, possibly boosting voltage-related stress on power semiconductors. In a flyback converter, the peak voltage across Input components the power switch vulnerable to voltage is determined by a stress typically include combination of the input those for protection voltage and output and filtering such as voltage as well as the X-capacitors (CX1 and transformer turns ratio CX2), Y-capacitors (CY1 and leakage inductance. and in the figure CY2), This peak voltage can and metal oxide varistors be difficult to calculate (MOV). All have known and typically must be failure modes when measured directly. exposed to voltages Conversely, above their rated under-voltage causes maximum. X-capacitors, higher currents in also known as “acrosscomponents such as the-line capacitors,” are the fuse, rectifier and used between the wires carrying the incoming ac current. A capacitor failure in this position will usually cause a fuse or circuit breaker to open. Y-capacitors, also known as “line-to-ground capacitors,” are used where capacitor failure could lead to the danger of electrical shock if the ground connection is lost. In this example, the efficiency of a 200-W power supply falls by 1% below peak when operated at 20% above rated power, causing power dissipation to rise by 30%. Thus a small change in efficiency increases power dissipation exponentially. supply from failure, it will cause a loss of regulation at the output. OUTPUT OVER-CURRENT To minimize cost or reduce bulk, designers may be tempted to size the power supply for typical load requirements without considering transient load currents above the chosen rating. Most power supplies contain over-current protection, but there are various types. Some have a well-defined current limit close to the maximum output rating. A too-close current limit can force the supply to shut down frequently. Other schemes are more flexible and allow short-term output currents to exceed the rated limit. But supplies with this type of protection (or those with no protection) can experience a temperature rise due to over-current that can degrade performance or cause a failure of MOSFETs, diodes, resistors or even copper traces. Note that power dissipation rises linearly with current in diodes, due to their fixed voltage, and exponentially in MOSFETs and resistive components. Chokes and transformers have a more complex response to overcurrents. Besides causing internal heating from coil resistance, over-currents can cause higher core losses and magnetic saturation, worsening power dissipation and heat rise. Saturation may also stop the power supply from operating or make component failures more likely. In a buck converter, where the ripple current is directly related to inductance, loss of inductance due to saturation causes higher currents in the MOSFET and diode. In some supplies, operating beyond the specified load range can cause the output voltage to fall below the regulated voltage limit. Some smaller supplies also have a minimum load-current below which regulation falls out. Temperature (°C) Typical behavior of an aluminum electrolytic capacitor over temperature. guaranteed outside of this range. Ignoring temperature limits may degrade the power supply efficiency, output ripple, regulation or noise-emission parameters. Key components of the power supply may have either a positive or negative temperature coefficient (PTC or NTC). MOSFETs are PTC devices whose onresistance rises with rising temperature. Bridge rectifier diodes, on the other hand, are NTC devices; as the forward voltage drops with increasing temperature, so, too, does internal power dissipation and heat generation. Depending on the individual power supply, either the NTC or PTC devices will dominate as the temperature changes, causing the overall supply efficiency to rise or fall. Resistors used to sense operating conditions and control the power supply typically carry little current, so they are generally not vulnerable to excessive heating or power dissipation. But temperature change affects their resistance value. The resistance change may lead to unwanted changes in power-supply parameters such as the regulated output voltage. Other effects can include early or late triggering of protection mechanisms that depend on sensed current. Automation & Control Freak? Same here. 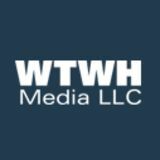 We carry more automation & control brand names than any other distributor in North America. It’s true – we checked. eliminates sources of energy loss. A graph of switching frequency vs. power output, and the applicable power technologies, illustrates how wide bandgap (WBG) materials both complement silicon and offer new capabilities for power electronic devices. 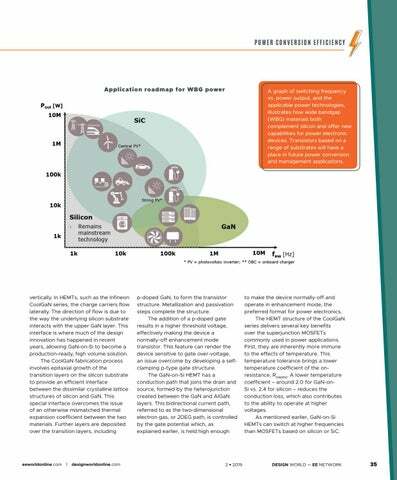 Transistors based on a range of substrates will have a place in future power conversion and management applications. to make the device normally-off and operate in enhancement mode, the preferred format for power electronics. The HEMT structure of the CoolGaN series delivers several key benefits over the superjunction MOSFETs commonly used in power applications. First, they are inherently more immune to the effects of temperature. This temperature tolerance brings a lower temperature coefficient of the onresistance, RDS(ON). A lower temperature coefficient – around 2.0 for GaN-onSi vs. 2.4 for silicon – reduces the conduction loss, which also contributes to the ability to operate at higher voltages. As mentioned earlier, GaN-on-Si HEMTs can switch at higher frequencies than MOSFETs based on silicon or SiC. A cross section of the GaN-on-Si HEMT structure developed by Infineon for its CoolGaN family. The GaN-on-Si HEMT has a conduction path that joins the drain and source, formed by the heterojunction created between the GaN and AlGaN layers. This bidirectional current path, referred to as the twodimensional electron gas, or 2DEG path, is controlled by the gate potential which is held high enough to make the device normally-off and operate in enhancement mode, the preferred format for power electronics. The reason is GaN-on-Si HEMTs lack an intrinsic body diode between the drain and source. The absence of a body diode is fundamental to what is probably the most important feature of GaN-on-Si, which is their vastly better reverse-recovery performance. In other transistor structures, a body diode significantly limits switching performance. The effect of a body diode in other forms of transistors results in a reverse recovery charge which has with it a peak current. Reverse recovery charge is the charge that accumulates in the PN junction of a MOSFET’s forward biased body diode. In most applications, current flows through the body diode twice for each switching cycle, causing charge to build up. Peak current in topologies that feature repetitive reverse recovery becomes inhibiting. The absence of a body diode and its associated reverse recovery charge and peak current is essential to the highfrequency operation of GaN-on-Si HEMTs. The ability to operate at high frequencies, in turn, allows them to make new switching topologies practical as well as play a role in halfbridge converters. CoolGaN technology, complemented by Superjunction MOSFET CoolMOS and CoolSiC solutions, make up a complete portfolio of power semiconductors for every application. 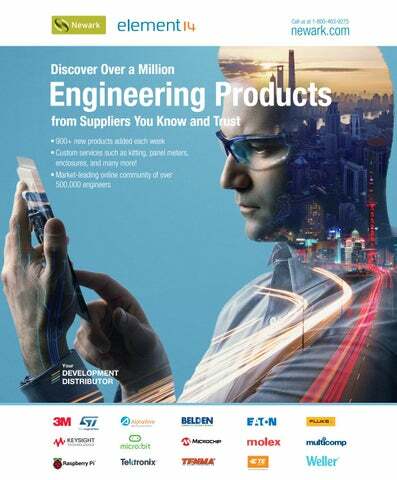 Proven integrity AND industry know-how Electrocube is one of the most respected design manufacturers of passive electrical component products for a wide range of standard and custom applications – from aerospace and audio to elevators and heavy equipment – as a capacitor supplier, resistor-capacitor distributor, and more. brought by super-fast switching power supplies could be delayed by a lack of magnetic materials that are up to the task. the schedule for APEC, considered the premier technical conference for power electronics, and you’ll notice a number of sessions devoted to magnetics. The interest in magnetics stems from gallium-nitride and silicon-carbide semiconductors. These wide-bandgap semiconductors have “on”resistances and related losses that are one-tenth that of devices based on silicon which reduces both their inherent capacitance and resistor-capacitor time constant. The result is lower losses per switching cycle, a consequence that lets GaN and SiC-based switch-mode power supplies switch at much higher frequencies – sometimes on the order of hundreds of megahertz. Therein lies the reason for the APEC sessions on magnetics. Operation at these higher frequencies can drastically reduce the size of the magnetic components involved in energy storage, but it is tough to find magnetic materials that can operate at such frequencies without experiencing a lot of energy loss. So the quest is on to find better ones. Cores on inductors like these become more difficult to devise as the operating frequency rises. Researchers are now examining exotic candidate materials such as nano composites in an effort to handle power supply switching frequencies extending into the hundreds of megahertz. Magnetization curve for a generic soft magnet A typical magnetization curve for a soft magnet with key parameters labeled: Ms, or the saturation magnetization; Mr, the magnetization remaining after an external field is removed; Hc, the value of the magnetic field necessary to remove magnetization after the magnetic material has saturated; and Χi, the initial magnetic susceptibility. Triad manufactures a wide range of popular oﬀ-the-shelf and custom designed chokes, inductors and other magnetic components designed for EMI/RFI suppression and noise ﬁltering near power components. Our advanced chokes and inductors oﬀ er superior performance, rugged construction, high quality, long life and excellent value. All are RoHS compliant. Triad’s CME Series Common Mode Inductors provide EMI noise suppression. They feature our e-core and are used in various types of power supplies. They also provide highly eﬀective diﬀerential mode ﬁltering and meet regulatory requirements. Normally placed close to the input source, these compact inductors are constructed with UL rated 130ºC materials. Triad’s CMT908 Series Common Mode Inductor features a sealed encapsulated design that is ideal for rugged environments and where reliability is critical. It provides superior common mode EMI noise suppression for power supplies and other power devices. stray inductance to suppress diﬀerential mode noise. In eﬀect, the CMF combines the features of two separate components into one. Amorphous soft magnetic material has a high conductivity. This and the thin layers that typically characterize its form factor keep eddy current losses low. There are a lot of applications for this material at frequencies up into the tens-of-kilohertz range. 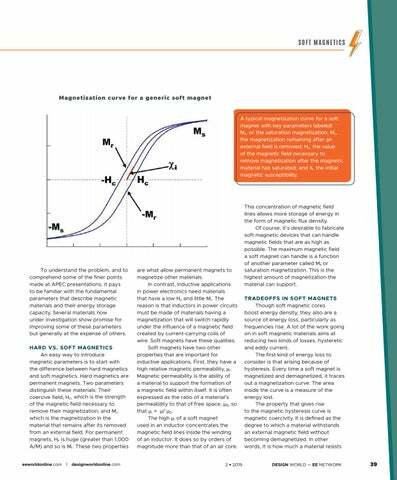 Some of the formulations of amorphous soft magnets use nickel and cobalt compounds to boost Ms and the Curie temperature of the amorphous and crystalline phases, thus allowing higher operating temperatures. Nickel is less expensive than cobalt, so it gets more attention among researchers. One difficulty associated with amorphous material is that it is quite hard, so hard that it would rapidly wear out conventional cutting tools. Water-jet cutting, EDM, and grinding operations have all been used to shape amorphous magnetic cores. But all in all, amorphous materials tend not be used in situations demanding magnetic material with complicated geometries. 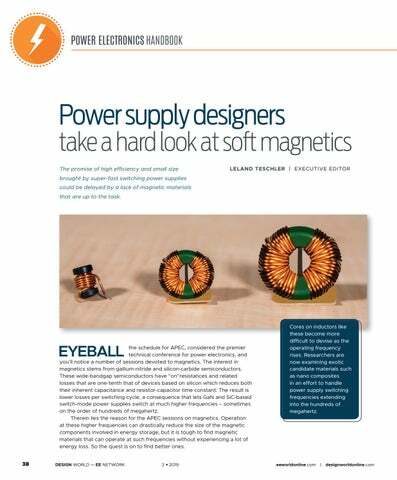 In inductor cores where the geometry isn’t complex, however, amorphous soft magnets can boost energy efficiency. The classic example is in cores for distribution transformers. Distribution transformers provide the final utility voltage step down, reducing the voltage in the distribution power lines to the level used by businesses and residences. Distribution transformers are energized 24/7 even when not powering a load, so it pays to minimize their core losses. Estimates are that about 10% of the distribution transformers in the U.S. now use amorphous magnetic cores. Another class of soft magnetics is comprised of composite powders. Soft magnetic composites (SMCs) use micrometer-scale iron and iron alloys such as Fe-P, Fe-Si, and FeCo. Research is also underway in nanometer-sized SMCs though none are yet commercially available. exhibit magnetic hysteresis and are referred to as superparamagnetic. This situation sounds good from the standpoint of a core material; there’s no Hc and µr can be high. The weakness of the scheme is that there must be enough nonmagnetic matrix material to hold the individual nanoparticles apart. If magnetic nanoparticles come close together, they can magnetically couple and form ferromagnetic domains, leading to domain walls and magnetic hysteresis. Researchers figure nanocomposite SMCs probably can’t be much more than 50% magnetic material. Still, the nanocomposite idea looks like a promising way of making materials with low losses. Need more energy than an EDLC? Need more power than a Lithium-Ion Battery? years ago, modern-day versions are simpler and assembled via more automated methods. you tore down an LED bulb manufactured a few years ago you’d likely find evidence of hand soldering and kludgy design practices. We found both in evidence when we examined LED bulbs back in 2015. We took bulbs from several manufacturers that all received the highest rankings from Consumer Reports. Several of them used epoxy potting material apparently to both add stability to the screw threads and to help manage thermal dissipation. A number of these mass-produced bulbs also displayed evidence of hand soldering. The most typical location was in making a connection between the LED plate and the circuit board holding the bulb electronics, but some bulbs contained other instances of solder globs that looked as though they had been done by hand. Back then, it was also common to see bulbs carrying sizable heat sinks. Many of the bulbs we looked at had metal heat-spreading components weighing in at a few ounces. And the circuitry driving the LEDs tended to be comprised of at least a dozen discrete components placed around the LED driver IC. LED bulb assembly practices circa 2015 included epoxy potting material used as a structural element for the bulb screw threads and base contact, beefy metal heat sinks (top), and handsoldered wire connections to the LED plate. Things have changed quite a bit in four years. We recently procured a new batch of 60-W equivalent LED bulbs to see the advances that have ensued since 2015. Like the last batch, these, too, were selected because they all got high ratings from Consumer Reports. 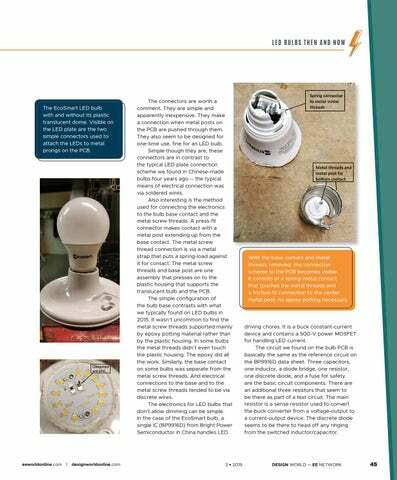 Consider the EcoSmart A19 LED bulb, which is assembled in China but comes from the Lighting Science Group in Florida. This 9.5-W bulb illustrates how simple LED bulb electronics can be so long as the bulb doesn’t need to be dimmed. Cut away the translucent plastic cover and you’ll find a dozen LEDs sitting on the standard metal plate. The plate attaches to the bulb’s plastic housing via two Philips screws and to the PCB electronics via two connectors. The EcoSmart LED bulb with and without its plastic translucent dome. Visible on the LED plate are the two simple connectors used to attach the LEDs to metal prongs on the PCB. With the base contact and metal threads removed, the connection scheme to the PCB becomes visible. It consists of a spring-metal contact that touches the metal threads and a friction-fit connection to the center metal post; no epoxy potting necessary. driving chores. It is a buck constant-current device and contains a 500-V power MOSFET for handling LED current. The circuit we found on the bulb PCB is basically the same as the reference circuit on the BP9916D data sheet. Three capacitors, one inductor, a diode bridge, one resistor, one discrete diode, and a fuse for safety are the basic circuit components. There are an additional three resistors that seem to be there as part of a test circuit. The main resistor is a sense resistor used to convert the buck converter from a voltage-output to a current-output device. The discrete diode seems to be there to head off any ringing from the switched inductor/capacitor. A view of the PCB board out of the plastic housing shows the pins used to make contact with the LED plate, the spring metal contacts making electrical connections to the metal screw threads and base, one of the slide rails into which the PCB fits, the metalized internal wall of the plastic housing (probably done for EMI concerns), and the plastic posts and screw receptacles for the LED plate hardware. The Bright Power reference circuit for the BP9916D. Two ICs make up the bulk of the LED driver, a diode bridge and the BP9916D from Bright Power. Also visible are the anti-ringing diode, the current-sense resistor, and other resistors that seem to be for testing purposes. to do with its ability to operate in critical conduction mode. 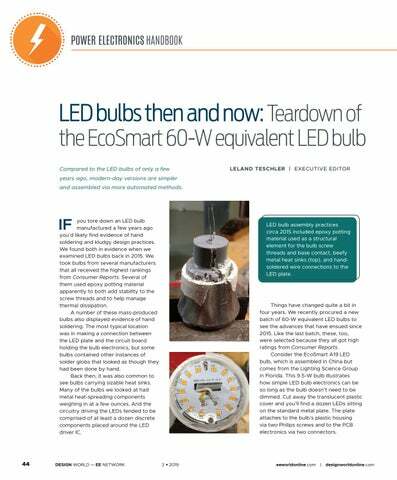 All in all, the EcoSmart bulb is an interesting example of how LED bulb assembly techniques have advanced over the past few years.